7.8 Earthquake hits the Solomon Islands. An earthquake of magnitude 7.8 hit near the Solomon Islands, but there have been no reports of major damage or casualties. The undersea quake was registered at a depth of 29km (18 miles), 100km (60 miles) south-east of Kira Kira. A tsunami warning issued for the Solomon Islands, Papua New Guinea and New Caledonia was later cancelled. Strong waves were reported after the earthquake struck at 07:14 on Sunday (20:14 GMT Saturday). People had been warned to stay away from low-lying areas, as high seas battered the coast. But no injuries or structural damage have been reported. 7.5 Earthquake hits the Solomon Islands. 6.1 Earthquake hits the Solomon Islands. 5.0 Earthquake his the Bougainville Region, Papua New Guinea. Tropical cyclone Ita is located approximately 55 nm south-southeast of Cairns, Australia. Category 4 Tropical Cyclone Ita powered ashore along Australia’s Queensland coast near 9 pm local time (10 UTC) on Friday with sustained winds rated at 145 mph by the Joint Typhoon Warning Center. Satellite loops show that Ita has weakened considerably since landfall, with the cloud tops in the eyewall clouds warming. Ita leaves 7000 without power in Australia – About 7000 houses remain without power after Cyclone Ita battered Queensland and authorities have warned it could be months until power is restored. Cyclone Ita ran south of Cairns but wind gusts of up to 100km per hour are still expected in the city. Residents in north Queensland are facing flooding and power outages as Tropical Cyclone Ita continues to make its way down the state’s coast. Weather-related blackouts in USA have doubled in 10 years. Most of the blackouts were triggered when extreme weather damaged large transmission lines and substations. Michigan had the most outages. 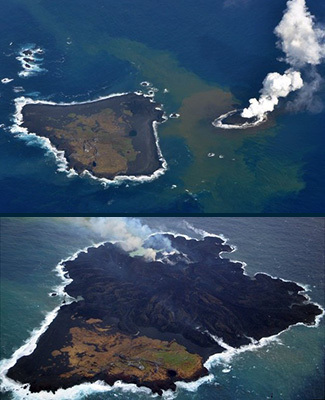 Two small Japanese volcanic islands have merged into one after the younger islet grew to overwhelm its older brother. Niijima Island broke through the ocean’s surface last Nov. 20 next to Nishinoshima, about 600 miles south of Tokyo. While scientists at the time questioned how long the island would survive before being eroded by the sea, it defied expectations and grew to merge with its neighbor and form one landmass. The newer portion is now larger than the original Nishinoshima, which last expanded during an eruption 40 years ago. The combined islands now stretch about 3,300 feet across and have together reached about 200 feet in height above sea level. NASA says that’s triple the height observed last December. Many volcanic islets formed in the waters off Japan during the 1970s and 80s, but they have since been reclaimed by the pounding Pacific surf. Top: Niijima Island shortly after it emerged just off Nishinoshima last November. Bottom: The new combined island after Niijima overwhelmed Nishinoshima.